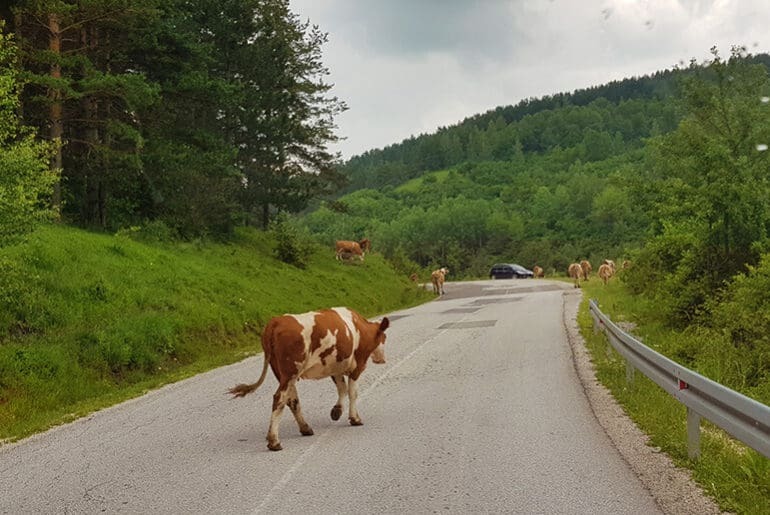 The rain got the better of us in Zlatibor so we headed further South in search of some dry, sunny weather, road tripping from Zlatibor to Uvac Canyon. The road meandered through the rolling hills of Zlatibor’s mountain. 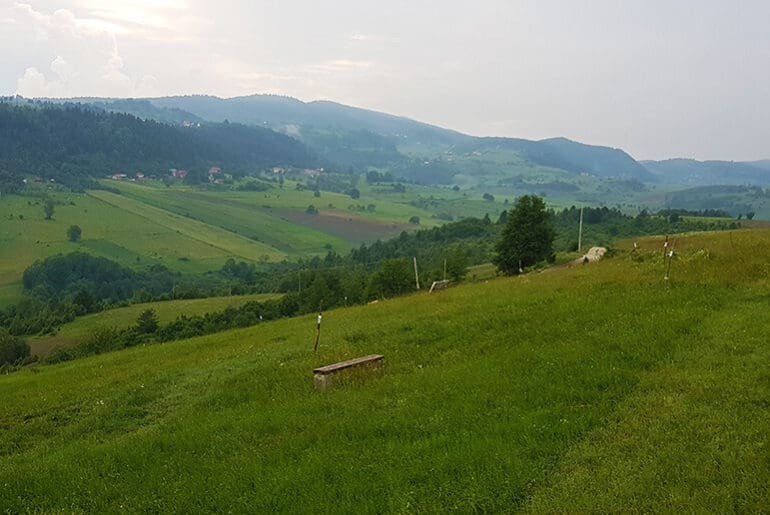 We passed the dense pine forests that gave Zlatibor its name (Zlatibor means “Golden Pine”), crawled through little villages at the 30km speed limit and enjoyed the picture perfect pastoral scenes unfolding before us. The roads twists and turns were numerous and Miles McFlattery was performing like a champion, in fact, for a 30 year old vehicle, his engine is amazing! He’s our very trusty steed and we heap encouragement on him through all the hills! The weather was also clearing which made us smile. We passed the Orthodox Church of the Holy Prophet Elijah in the village of Dobroselica, one of the smallest churches in the area. More rolling hills and then before us was vast Zlatar Lake. Zlatar lake (Zlatarsko jezero) is an artificial lake that was created after the construction of a dam on the Uvac River. We passed lots of fisherman and little rowing boats. If the weather had been warmer, we would definitely have stopped for a swim, as the water was crystalline and looked so inviting. Shortly thereafter, we passed through the town of Nova Varos, with its houses all perched on the sides of the hills. We wanted to do a tour on the Uvac River and I considered stopping in the town to book at one of the tour agencies, but parking was non-existent for Miles, so we continued on. I had chosen to stay at Uvac Campsite and had dropped a pin on Google Maps so that waw were we headed. The road soon became one-laned and filled with potholes, but the scenery was gorgeous, so we slowed down and continued. Until we got to a dead-end that is!! Our google pin was showing, but Google Maps couldn’t find any roads to get us to the pin. Now what? While deliberating what to do next, an elderly local fisherman approached the van wanting to assist. That would have been wonderful had he been able to speak English or if he’d been sober! An afternoon of beers – I could see the pile of cans on the table where he had been sitting – had left him rather less helpful than he could have been. He kept taking my map and then my phone and pointing and talking but what he was saying eludes me still today. I thanked him for trying to help and tried to leave, but he was rather enjoying blathering a steady stream of Serbian at us. It was rather amusing and eventually, we managed to get going again. 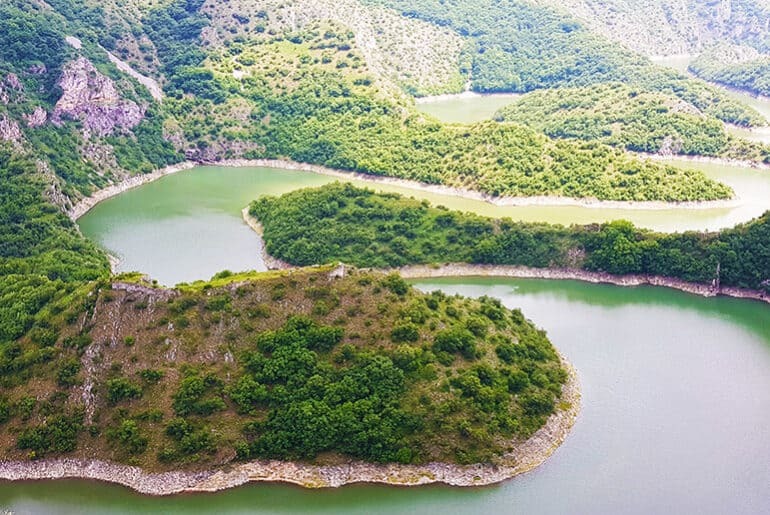 I tried a few more roads to find the campsite and then gave up, deciding to rather make our way to the Sjenica Lake (also known as Uvc Lake) on the Uvac River to have a look before making any more decisions. The road took us straight to the dam wall where we found a wooden structure and parking lot. Some boats were arriving so I wandered down to the jetty to ask about the tour to see the Uvac Meanders. The captain said to be at the dock at 10 am next morning to do the tour and that it was perfectly fine to spend the night right here. Oh, joy and what a view! The Uvac Special Reserve was established to protect the largest colony of griffon vulture in the Balkans. On the hill just behind us is the vulture’s “restaurant”. Locals and conservationists have cleared an area and they regularly place animal carcasses in this clearing for the vultures to feed on. It is due to this feeding scheme that the Griffon Vultures have flourished and the colony is getting larger. We borrowed a pair of binoculars and were amazed to see more than 40 vultures in the clearing. A truly incredible sight. This is a karst area and the Uvac river has carved deep meanders through the Uvac Gorge. I’d seen amazing photos of the meanders and couldn’t wait for our boat trip the next day. And so we came to the end of our road tripping from Zlatibor to Uvac Canyon adventure! This wild camping spot was great! Right on the dam wall. Nice and flat and the tours leave from the jetty here at 10 am every morning to take you to the Uvac River Meander and to the cave. From the dam wall, look up to the hills and you will see a clearing with about 50 Griffin Vultures. The locals put food here for them. Quite a sight!